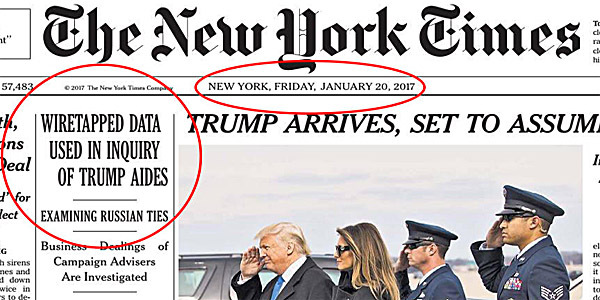 While one of the New York Times writers of the above headline either paid for NOT even writing the story he is credited with, or not, it is a legal and manifest fact that the New York Times print edition of January 20, 2017 boasted that President-elect Trump and his aides were monitored by electronic surveillance, or in lay terms, wire-tapped. Mark Dice on March 4, 2017 lays out that knowing Trump was obviously under electronic surveillance, even as Obama had the Associated Press and many others monitored. But on March 22, 2017, finally, the Chairman of the House Intelligence Committee is forced to admit...yeah, Presidential candidate and then President elect Trump was spied upon. What is not told you, is that the surveillance under Obama via the "Transition Team" began way back on May 6, 2016 by Obama's Executive Order. The electronic surveillance of Donald Trump and his aides was coordinated by the White House Transition Coordination Council (WHTCC), and therefore authorized by Obama...and as for anything prohibited by law, well, the WHTCC probably claimed "executive privilege". On March 22, 2017, we can now officially say that President Trump is vindicated in his wiretap by Obama statements. "House Intelligence Committee Chairman Devin Nunes (R-Calif.) said Wednesday that members of the Trump transition team were under surveillance in the final months of the Obama administration. ...most of this surveillance apparently happened in "November, December, and January" during transition"
“The more evidence that comes out, the more we are seeing that these claims were either manufactured, or like the officials said today, intelligence was released in a partial fashion, and some of that intelligence, as they said on the hill, was ‘dead wrong’. the writer added. What Kredo is referring to is that it appears a ‘false flag’ cyber operation may have been conducted by intelligence operatives to make it appear that Trump was in contact with Russian entities, thus justifying ‘wiretapping’ communications coming from Trump tower. As Infowars reported earlier this month, the Wikileaks ‘Vault 7’ documents revealed that this process is something that the CIA has been actively working on for some time. A CIA project identified as “Umbrage,” maintained a substantial library of Russian cyber-attack techniques “stolen” from malware produced in other states including the Russian Federation. Reports dating back to last Summer indicated that computer experts working for the US government identified what they thought was malware emanating from Russia. One destination domain, Trump-Email.com, stuck out because the conspiracy theory of Trump colluding with Russia was already being heavily floated by Hillary operatives and parroted by the mainstream media. The malware appeared to have been connected to two Russian banks – Alfa Bank and SVB Bank, and was suggested to be proof of secretive communications, or possible illegal banking activity. Many believe that this spurred the Obama administration to obtain FISA permission to conduct electronic surveillance, directed at ‘the Russians’ in communication with Trump tower. In other words, there is significant evidence to suggest that the CIA could have planted information as a means of deceiving the NSA into believing Trump and Russian entities were communicating. Even though the FBI found no evidence for any of the accusations, an investigation still appears to have been continued. The domain Trump-Email.com turned out to not even be owned by Trump. The entire story has already been thoroughly debunked.